Very fast shipping! Great seller!! lighting fast shipper, A++ seller. delivered on date as guarenteed. Thank you. Fast shipping. Quality product. Returned item and no refund!! Best HDMI converter lets the TV upscale no distortion. Gamecube recognizes the connection properly and prompts for progressive mode. 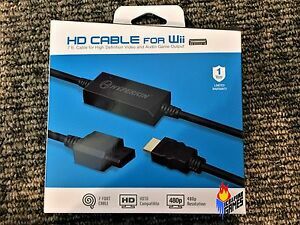 I bought a wii2hdmi adapter a while back, sadly it didn't work with my wii games, only gamecube games. I was skeptical due to it for this product but I decided to bite the bullet and I can say I want disappointed. Obviously the Wii is limited on its visuals so don't expect a huge 1080 pic or anything like that but it is a huge step up the composite cables. For the gamecube games it's a true upscale and games look magnificent as they should've been played.